If anyone was looking for my WWW Wednesday post yesterday, well . . . I didn’t write one. My answers haven’t changed since last week’s post, so take a look over there if you’re curious. Luckily, I do have something to post about today . . . Yesterday I was surprised and honored to receive the Liebster Award from fellow blogger Claire at Art and Soul. Thank you so much, Claire! I’m so glad you enjoy my bookish ramblings here! 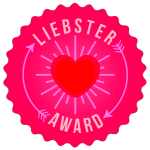 The Liebster Award is given to bloggers by other bloggers as a way to recognize and/or discover new blogs. Nominate (insert your own number here) other bloggers and link them. Create new questions for the nominees to answer. Stay motivated and keep blogging. I originally started this blog because of the writing group I was in a few years ago. We were talking about becoming published authors and one of the members said it was a good idea to start a blog/website to go ahead and start getting followers and doing some social networking. So we all started blogging. What’s the best thing you’ve seen on TV/at the cinema recently? To be honest, I don’t watch a lot of TV and don’t go to a lot of movies. The only thing I am currently watching on TV is So You Think You Can Dance because my family loves dance shows. If you could go anywhere on holiday, no expense spared, where would you go? Hmmm. That’s tricky. My favorite place to visit usually is New York City, so it would be nice to have an unlimited budget to go. Get a really nice hotel right in the theater district. Go to as many shows as I can. If I had to pick someplace I had never been, I think I would say . . . London. Or actually, all of the British Isles. I’d love to do London and see all the sights there, but I’d also really like to visit Ireland. And Scotland. And Wales. Did you enjoy any of the books you were forced to study at school? Did you have a favourite? I actually enjoyed several books that I had to study in school – I ended up going to college as an English literature major. If I had to pick books that I studied in high school, I would say that my favorites were Jane Eyre by Charlotte Brontë and Crime and Punishment by Fyodr Dostoevsky. And finally, if you could learn to do anything, what would it be? It would definitely be something musical. I love to sing and I know how to play the piano and the flute (although it’s been a while), so maybe some other instruments? I’ve always wanted to know how to play the guitar and the drums, and for some reason, the trumpet. And the French horn. And the violin. So . . . could I just be blessed with unlimited musical knowledge? Is that a thing? What is a book that you read that changed your life in a significant way? If you could insert yourself into any book, which would it be? If you could make any change to a movie adaptation of a book, what would it be and why? What is your favorite new author that you’ve discovered this year? Of all the characters you’ve read about, which one would be your best friend? Brilliant answers! I loved Jane Eyre at school too. It was the first “literature” we were made to read and I think lots of it has stuck with me ever since. Do come and visit us in the UK! So many nice places to visit 🙂 Although I’ve been to NYC twice on short trips and would love to go back there again. How is the work on your fantasy novel going? I’ve just started writing my second romance (more Pride and Prej than Mills and Boon!) and it’s hard going.